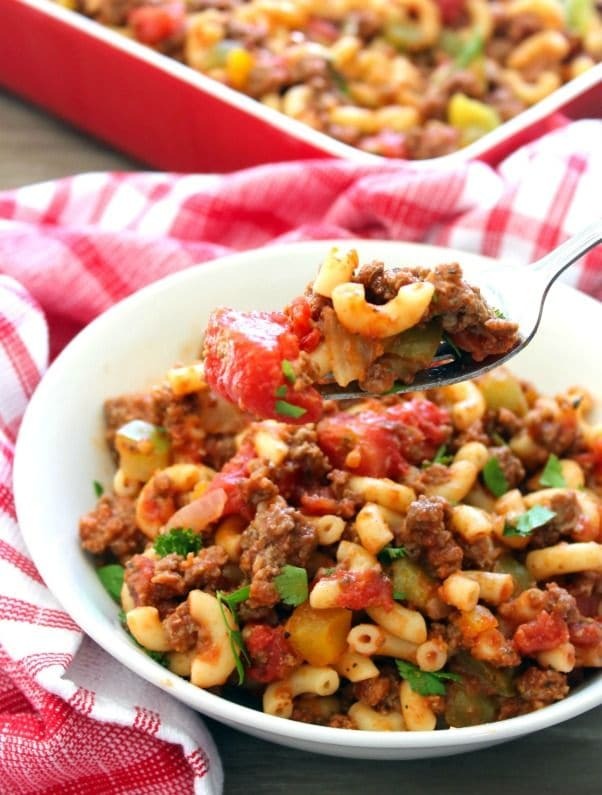 This classic Southern-Style Tomato Mac and Beef Recipes are one of the most delicious, easy to make, flavorful meals from Southern-American childhoods, made with hearty ground beef, organic tomatoes, green bell peppers, sweet onions, a healthy dose of garlic, and herbs. You will totally fall in love with how easy this recipe for Southern-Style Tomato Mac and Beef comes together on busy work or school nights. It’s one of the recipes that I used to make when my son was little after a long day at work, believe me, it’s a total crowd pleaser with the hubby and kids that won’t stress out the mom. My Grannie, always said, “Life is meant to be lived outside of the kitchen some nights.” So if I have a busy day, I want something hot, fast, and flavorful that won’t keep me in the kitchen long or stressed out cleaning up a big mess of dirty dishes or pots and pans. What about Y’all? I mean one of the hardest things about being a working parent, is being extremely tired and dealing with picky eaters that are starving. This is a dinner idea that will keep you from digging out those take menus and/or hitting the drive-thru windows. You have to love a no fuss no muss menu item. In a large deep metal skillet on medium heat, add the ground beef, a healthy splash of Worcestershire sauce, a few pepper flakes, kosher salt, fresh ground black pepper to own taste, and cook for about 7 minutes, breaking up lean ground beef as you go. Add the chopped onion, diced green bell pepper, and minced garlic to the metal skillet over medium heat and cook until ground beef is completely done. Drain the ground beef if necessary. Add 2 cans of organic stewed tomatoes, 1 can of organic tomato sauce, the organic tomato paste, garlic powder, onion powder, kosher salt, and pepper to own taste, to metal skillet; stir to mix combine the ingredients together with ground beef. Cook for about 20 minutes or so. Meanwhile, cook 8-12-ounces of macaroni noodles al dente, according to package directions. Drain the macaroni noodles. I do not rinse mine as it makes the sauce cling a little better. Combine the cooked al dente macaroni noodles and the tomato and beef mixture in a large dish, garnish with the chopped parsley and serve immediately. Save the recipe by hitting the Pin or Print Button! What a comfort dish that will fill a person up. I love all the flavors in this Mac and Beef and looks like just the kind of easy recipe that will fill the whole family. Ooh, I would LOVE a big bowl of this today! The sun is out but it’s chilly, which calls for some Tomato Mac and Beef! Love the addition of green bell pepper for a little bit of crunch. This looks awesome for dinner on a chilly day! I haven’t had mac and beef in ages! I remember having something like this as a child! Such a wonderful comfort dish. Perfect for using ingredients often on hand too. I’ve never had anything like this before – it sounds great! Perfect for the chilly months ahead. This is taking me back! My mom used to make something like this but I haven’t had it in so long! Saving this to make soon – delicious!